Great price, great delivery and great battery. Fantastic Battery. Holds charge amazingly well. Super happy! Excellent quick service.Battery superb ,price very competitive .Well done Tanya! Excellent service. Let you know what's happening with your order and excellent product at a good price. Top product excellent service. Best price best overall deal. Others wake up! Chris Knight Fantastic supplier. Fast delivery had to give it a couple of hours top up on smartcharger to get it to 100% but that's understandable as battery's bound to have been sat around for a bit like any other new one. Spot on would use again. It's the second time I've bought this battery. The last one was 6 years ago, and still working OK. Just didn't want to chance it with the cold weather arriving. (Jump starting my car is not recommended.) 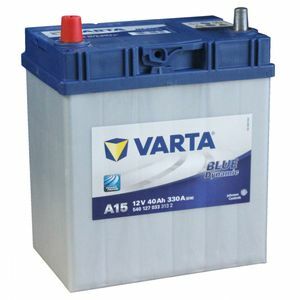 Varta is a trusted brand, costs 35% of the price of the manufacturers battery, the last one lasted 6+ years and I received the usual faultless Tanya service. What's there not to like? 2nd time I've had appalling service from their courier company. They pretended to have called but lied about it and after three more days we gave up and cancelled the order. The two times I have had proper delivery the product was good, but it is hard work and I wonder if it really worth the savings? Excellent product, fitted our lawn tractor immediately and exactly the right size . Delivery was superb and it arrived very quickly by courier here to France.